This research guide provides information and resources related to Connecticut State Courts, other State Courts, Federal Courts, and the United States Supreme Court. Click on the tabs above to access Connecticut State Library print and electronic resources, court websites, and other external links and resources. The reading room is open during the library's regular hours. These subscription databases can be used with a Connecticut State Library Card. The external links below are provided as an information service only. They provide free case law, but do not include a citator service. The Connecticut Judicial Branch website explains the history, role, organization, administration, and operations of Connecticut courts. Below are selected links on the Connecticut Judicial Branch website and the Connecticut Probate Court website. For additional print resources, please see a librarian or search our catalog. The Connecticut Practice Book is available in print in the Law Reference area. Our collection includes court rules of practice dating back to 1879. The 2009 edition through the current edition are available electronically. This 31 volume set covers many topics of law, including family, civil, criminal, appellate, elder, employment, construction, etc. Many volumes include sample forms. This set is in the Law Reference area. It is also available through the Westlaw database. 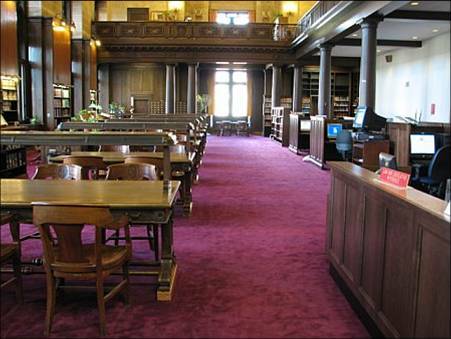 Supreme Court records and briefs in print (1786 - 2009) are located on the 4th floor of the library stacks. Supreme Court records and briefs (1986 - present) & Appellate Court records and briefs (1983 - present) on microfiche are located in the Law Reference area. The digest includes case citations for state and federal courts using the Key Number System. It is located in the Law Reference area. The Key Number system is also included in the Westlaw database. This series of 9 books covers death taxes, settlement of estates, probate practice, powers of attorney, trust administration, etc. These volumes are located in the Law Reference area. They are also available through the Westlaw database. For additional electronic resources, please see a librarian, view our digital collections, or browse our list of databases. Selected Connecticut Law Tribune (CLT) eBooks are available at the CT State Library. We also have many CLT books in our print collection. Includes primary law from all 50 states as well as treatise libraries on elder law, employment law, estate planning, evidence law, family law, insurance law, personal injury law, real estate law, remedies, and more. Comprehensive historical collection of legal and law-related material, including many North American legal journals. Coverage: From 1800s to present. Continually adding new content. View Judge & attorney biographies that were printed in the Connecticut Reports. Thomson Reuters Westlaw (formerly WestlawNext) offers current and historical state and federal statutes, case law materials, periodicals, law reviews, and other legal resources. Coverage: 50 States; District of Columbia; U.S. Supreme Court; U.S. Courts of Appeal; Federal District Courts and Bankruptcy Courts. This publication includes the Rules of Professional Conduct, the Code of Judicial Conduct, Superior Court Rules, Appellate Court Rules, and information related to official forms. For Supreme and Appellate Court cases, this handbook can be used in conjunction with the Connecticut Practice Book. This publication includes the rules for all types of probate cases with references to applicable statutes. Official copies of Connecticut opinions are located in the Law Reference area. Connecticut Reports are the opinions of the Connecticut Supreme Court. 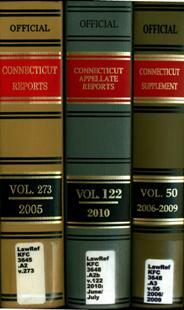 Connecticut Appellate Reports are the opinions of the Connecticut Appellate Court. The Connecticut Supplement includes selected Connecticut Superior Court opinions (chosen by a committee of State Trial Referees for their significance). Understanding Connecticut Legal Citations, a document prepared by the Connecticut Judicial Branch, explains the citation formats for Connecticut opinions. If you are seeking historic or archival court records, please see our State Archives finding aids.